Royal Mail understands that many companies and households are finding it hard in the currenteconomic environment. As a result, we have considered any pricing changes very carefully and in doing so have sought to minimise any impact on our customers. The Postcard, European 20g and Worldwide 10g rates increase from £1.17 to £1.25 - nearly 7%. The Worldwide 20g rate increases from £1.40 to £1.45. The European and Worldwide 100g rates reduce by 2p dropping to £1.55 and £2.25 respectively. These changes take effect from 26 March 2018. New Tariff stamps (details not yet announced) will be issued on 20 March, the same day as the Royal Air Force Centenary Set. However, the purple/plum £2.25 is still available from Tallents House from the 2015 printing and in Royal Mail's apparently increasingly cost-conscious climate, I could see that colour being reused and therefore existing stocks not wasted. Similarly the 2015 £3.30 Rose Pink could now be used for the Worldwide Large Letter Zone 1 100g rate instead of the Zone 2 rate, and the 2015 £3.15 abandoned. 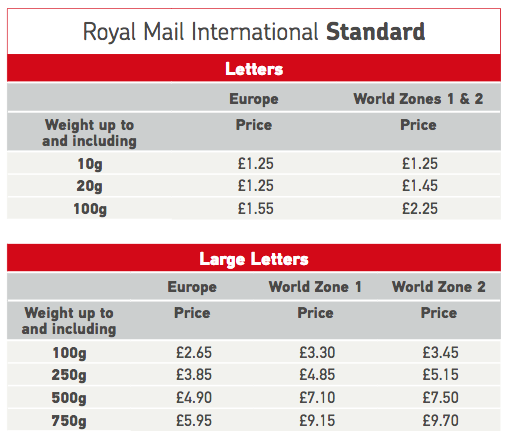 There might be a new £2.65 replacing the £2.55 for the European Large 100g rate and a new £3.45 for the Large Letter Zone 2 100g rate but these stamps are apparently not used by many post offices and it seems they are mainly bought by businesses from Royal Mail's website. As readers of the comments will see, a letter from Royal Mail indicates that the £2.25 (at least) will be printed by International Security Printers rather than De La Rue. We await more news! Going by the comments down below, the £2.25 must be the existing colour purple. Tallents House will probably send out a new printing of M17L or M18L, but Post Office supplies may still have M15L or M16L stocks which will make their way into branches. It may not have escaped your notice that all the new international rates are now multiples of 5p. I think we can be fairly sure that if the inland letter rates were not regulated in the way that they were, there would be some simplification changes to those rates. Some people would like to see the return of the 9p, but that would only help in one case. With the rate differentials currently as shown, how much easier it would be if differences were a multiple of 5p/10p. This picture is in the Royal Mail Philatelic Bulletin received today shows the four new stamps but with the values obliterated. We now know that these are £1.25, £1.45, £1.55 and £2.65. First thoughts: the top two values are remarkably like the £5 azure and £3 purple; the green in this picture is very similar to the 2p, and the grey is, well, grey! 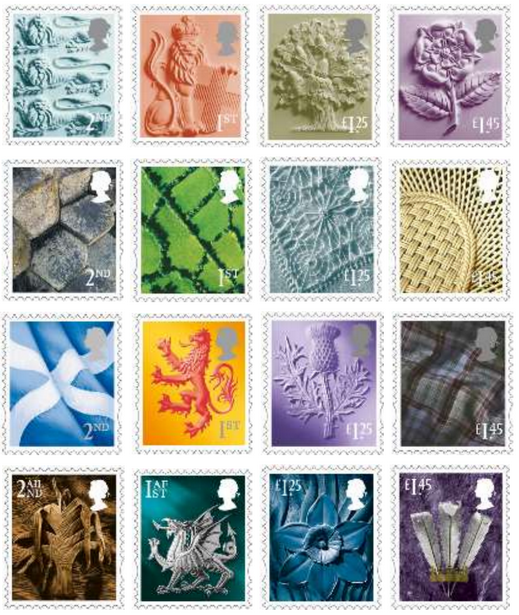 On their first day cover, Royal Mail are including only the four new colours; as the £2.25 is a new stamp from a new printer we will include that on our first day covers. If you wish to have one of these, please let us know as soon as possible. We will have very few for stock after the date of issue. Hot on the heels of the Bulletin was an email to registered dealers with more details of the new stamps. As predicted by one of our Anonymous commenters, the 2nd & 1st country definitives have had a make-over with the new font being used for the denomination. Just how necessary this is given the small number that any of us see on letters, or find in our post office branches, is a matter for debate. 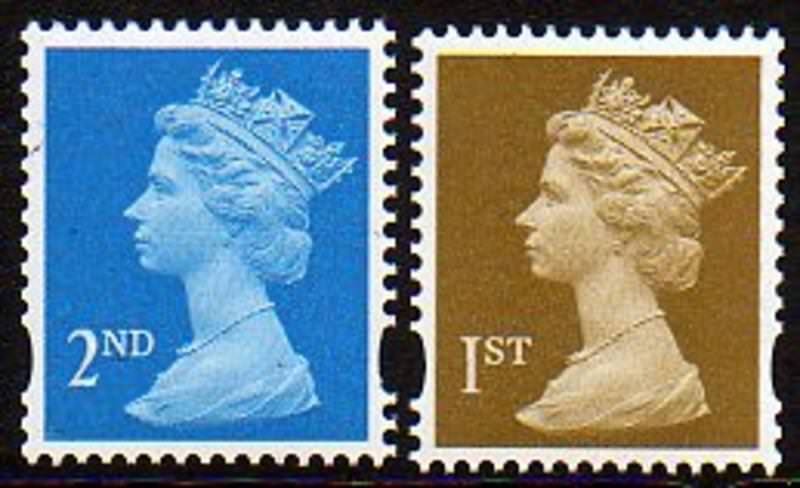 From these pictures it appears that the 1st class Lion may well be the only one to have the denomination in silver-grey, because white would certainly not show on the yellow, not that that has stopped them using white for the 2nd class England stamp which joins the top value for Northern Ireland in having a face value that is almost impossible to determine. The prices listed are post Tariff, all orders between 20th & 25th March will be billed at the appropriate rate. This will also apply to standard customers who will be advised accordingly. I suppose we can expect new £1.25, £1.45 and £1.55 stamps for the international letter rates. Also an "18" reprint of the £2.55 seems likely. It begs the question of whether they will continue to bother with having stamps for international large letter rates. It would appear that they currently sell very few of these stamps. If they continue having stamps for these rates, I suppose that we could look forward to new £2.65 and £3.45 stamps with a possible "18" reprint of the little used £3.30. My guess for new Machins will be £1.25, £1.45, £1.55, £2.25 (reissue?) and £2.65. As well as Machins do not forget the new country stamps. Here in England you cannot usually find them in Post Offices until a fortnight or so after the tariff change and then they typically get one sheet of £1.25s & one of £1.45s. The is the time to get them. With speculation over the monarchy I expect there will be more interest in this year's issues than usual. Thank you: of course there will be 8 more country definitives. According to my sub-postmaster the horizon menu allows him (in England) to order all of the countries' stamps. Whether he would be supplied is a different matter. To Anonymous 19th Feb at 12:00. What speculation over the Monarchy? The same old 'story' that the Queen may abdicate in favour of either Charles or William! That won't happen, so look forward to lots more Machins to come. Interesting to see Royal Mail introducing a new tariff on 26 March 2018. The £1.40 and £1.57 RAF Centenary stamps will be obsolete after being on sale for 6 days! I think I will try to stock up on second class! Votes if I can get, else country definitive. For variety, don't forget other countries - and post and go, while Game of Thrones are still around. I will receive the Machin and Country stamps tariff changes from Tallents House. The cost, excluding the 45p post and packing will come to £24.95. 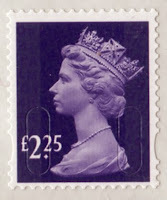 A letter says that the £2.27 stamp will be reduced to £2.25. A £2.25 stamp was previously issued in March 2015 printed by De la Rue, but there will be a new printing of it by International Security Printers ! Does this mean that ISP will now be the future printers of Machin counter sheet stamps ? There is no further details in the letter of what will be issued on 20th March. Could anyone work out what the £24.95 will consist of from the info supplied by Ian ? 5 each of £1.45 and £1.55 is £13.50. I can only get another £3.80 on top of that unless the large letter airmail rates get new stamps. Given Marcooni's comment below, none of this makes sense. We're still waiting for details of new stamps. If that figure includes the service charge, perhaps that is up from 45p to 55p? Now Marcooni's &.35 is the sum of these, plus 45p service charge, LESS the £2.25 so it must be the existing colour and maybe not by ISP unless Marcooni only has new stamps and not 'visible changes'. (In the past, a change of printer - which affected only the cylinder number! - was regarded as a visible change by TH. How about this to justify the £24.95 ? Congratulations, that’s an impressive piece of calculation! I hope you’re wrong about the country 1st and 2nd redesign. Going back to this from http://blog.norphil.co.uk/2015/12/gateshead-printer-de-la-rue-loses.html, could Royal Mail be seeking a UK based printer for their stamps if ISP are printing the £2.25, if so what fate will befall Cartors’ output? I don't think RM are looking for a UK printer; ISP print in gravure at Wolverhampton and Litho at Cartor's premises near Paris. Thank you for the congratulations Ian. I seem to recall reading about the country 1st and 2nd class 'value' design change somewhere on your splendid website, but I could be wrong. The BPB April 2017, page 238, has a short report about the change of type font. As regards ISP printing the new £2.25 value I presume this will be the subsidiary Walsall. Some years ago due to a mix-up both De la Rue and Walsall printed the 78p 88p and £1.88 tariff changes. With reference to my previous post, my order advice note quotes £23.15 , I have tried to work out what I will receive but i cannot account for what stamps I will receive, roll on 20th March :-) on the point of the £2.25 stamp my letter says that all customers who have opted for non visible change definitives will automatically receive this stamp. wait and see time. As Royal Mail don't take any notice of the security coding, from the point of view of identifying stamps, this is no different to the 2015 original issue. Therefore it is not a visible change, but a non-visible change. "The new distribution now is on the basis of 'visible change' - NOT, we understand, the fact that the year code is MA13 and not Walsall's M13L, but because the sheet margin shows a different printer by the cylinder number." Inconsistency is nothing new for Tallents House, so this should not come as a surprise: or perhaps they are just accepting that they got it wrong in 2013. Hi Ian, just an update, I successfully ordered the £2.25 stamp from TH using the code DS225NVC I am surprised but happy. Thank you Ian, I will keep you posted. I will contact TH in 2 weeks as today they could give me no information at all. As regards the £3.15 and £3.30 stamps issued on 24/03/15, the TH Stocklist says that the 'last sale date' will be 21/03/18. But I can see why they will be off philatelic sale: I haven't sold any of these for months! Any collector who hasn't bought them well before now, should have done so. I have a standing order from Royal Mail for definitives and first day covers of definitives. I've just got a letter saying the tariff changes will cost me £52.49! I thought it was a misprint at first. They must get quite a lot of revenue from collectors simply by varying prices! A diminishing amount of revenue with the diminishing number of collectors who have standing orders. And bear in mind that the Machin FDC will have only 4 stamps on it, missing the £2.25 which is also new. It may not get a new SG number, but it is a new printer and a new year code. I'll be doing a few FDCs with all five stamps on. Perhaps the £3.30 stamp will reappear on the next TH Stocklist, as by then it will be Zone 1 100g large letter rate as you say Ian. This begs the question, will it ever be reprinted on SBP2 ? Has anyone else noticed that RM are charging the new 1st & 2nd class rates for the new printings of country 1st & 2nd , 6 days before the new rates come into force? A bit unfair I think. I've raised this with TH because they made the same error on dealer's order forms. Which doesn't seem to tie in with what is shown on standard customers' DD advices. My advice is to ask for a refund if you get overcharged! Yes Ian I complained to RM and just received an E Mail to say I will only be charged the current rate for the Country 1st & 2nd class issue. The 'problem' with the Regional stamps (and of course many Commemoratives) is that they are 'gummed' and not self adhesive. To some this doesn't matter but if you are doing a bit of eBay trading or a small trader then many times you need to use a plastic type of envelope or bag. Gummed stamps won't adhere. I recognise that larger businesses will use labels and probably don't queue at a PO counter to purchase stamps. There was a lot of debate moving towards self-adhesive and one argument is that they are more hygienic i.e. not having to lick them. A significant number of POs that I visit don't recognise the word 'Regional' and hence have no idea what such stamps look like. I do find, however, that some POs have Regional stamps in their counter book but are tucked away at the back and never get used. I did once spot some higher value (I think at the time they were the 97p English) and enquired whether they get asked for. The reply was something along the lines "oh I think we were sent them with our normal supply at one point, but we just put them in the book, nobody ever asks for them....". At a Crown Office (recently closed and now in W H Smiths) I did ask for some 1st class English stamps. That caused total confusion and you can imagine the responses!! I don't think I have ever received a letter (other than containing some promotional material or catalogue from a stamp dealer) with a regional stamp affixed. Just received my "First" from RM and on page 6 the cost of a Country Definitive Pres'n Pack CP036 is £16.30, yet on RM's website it has a cost of £16.15. Typo or what ?? Does anyone know why ISP are printing the 2018 Machin tariff change stamps ? Previously Machin counter sheets were printed by De La Rue. ISP (Walsall and Cartor) now print the whole Royal Mail range and source of stamps. DLR printed the 2017 Christmas counter sheets; will this be for the last time ? And what about Enschede ? Ignore the headline (copied from the local newspaper) but read the article. The contract was up for renewal a year or more ago, but I don't know from what date it would operate - obviously not immediately. Maybe DLR have moved all stamps to Malta; maybe they didn't even bid? ISPW did emergency printings of 78p, 88p & £1.88 so they are not unused to doing counter sheets.